Whether your power went out because of a natural disaster, or you find yourself moving across country and need to start over with an empty fridge, here is my advice for how to restock on a budget. When you finally open your fridge after a power outage, the smell can be totally overwhelming. You no doubt want to throw everything out as fast as humanly possible. If you can stand it, however, try to make a list of what you’re throwing out. And definitely do this before a big move. Write down everything – all those condiments, frozen sauces and whatnot, that you wouldn’t immediately think of – until you reached for it and it wasn’t there. With your list of “what we had” (which might, by the way, come in handy for an insurance claim, too), you can start to formulate a list of what you need. A weekly trip costs me between $60 and $120. I spend the upper amount if our fridge is looking really bare (you know, when you open it and think, “Ugh, there’s nothing to eat in here.”) But that trip likely doesn’t include all the back end stuff that gets purchased sporadically. Starting from scratch could easily cost $300 or more – and that’s not counting kosher beef. Unless I’m pulling cash from the emergency fund, our budget couldn’t handle a $300 bill, so I’d need to prioritize! When you make your list, try thinking about what your family will eat that week. Make a simple menu plan (post-power outage is not the time for gourmet) and then create a detailed list of all ingredients that are required. If you are serving pasta and sauce and your three year-old simply will.not.eat.it without grated cheese (for example), be sure to put cheese on your list. Whereas the pickles and horseradish that got tossed and listed with Tip #1? Those probably don’t need to be replaced immediately. Now is definitely a time to employ all those strategic shopping strategies we talk about. Make a list, shop only according to that last, refer to your price book, and try to combine a coupon with a sale when possible. The priority items from Tip #2 will need to be purchased, even if there’s not a sale. So make sure that your priorities are actual necessities. Ice cream (much though you might love it) doesn’t need to be on the priority list, if it means paying $5 a gallon. Because we all know with a sale and a coupon, you can get the same ice cream for under $2/gallon. Once you’ve made your list, flip through that week’s grocery circulars. Are there any items you can substitute in that will cost half the price? Any items on your “Priority B” list that are on sale for a rock bottom price that week? Finally, pull some coupons to match with sales and even on the non-sale items. 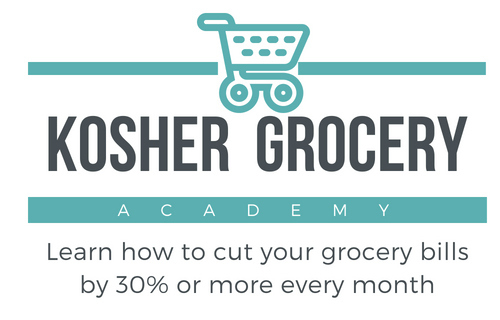 Check the Kosher on a Budget Coupon Database – just plug in the item you are looking for and it will tell you all the current coupons (printable and newspaper). An hour of prep time before you hit the store can easily save you 35% or more. Your fridge didn’t get full overnight, and you don’t have to refill it overnight either. Rather than trying to replace everything right away, try working through your priorities over the next three to four weeks. You may even discover some items that don’t need to be replaced at all! Think of it like cleaning out your fridge for Pesach. We don’t rush out to the store motzei yomtov to restock all of our syrup, ketchup and mayo. When you make your meal plan, be sure to factor all the stuff that you already have into the rotation. Shopping from your home is free this month! Losing the contents of your fridge is upsetting, but losing the contents of your freezer – especially if it’s stocked with meat and chicken like ours is – could gut your budget for the month. The good news is that during a power outage, a chest freezer will keep your food frozen for three days – whereas an upright will only stay frozen for one day. If you are planning to buy a freezer in the near future, I’d recommend a chest freezer (plus, it uses less electricity on a daily basis). And if you have a chest freezer, you may want to consider using it to store more of your meat, chicken and dairy. For a driving move, you may be able to eat down your freezer in the days and weeks ahead of time, and then move a small amount of what’s left in a cooler chest, so you can have “free” dinner in your new place. If you’ve experienced a three-day or less power outage, your freezer food should feature prominently in your menu plan for that coming week. For those of you with experience (recent or otherwise) with restocking your fridge and freezer, I’d love to hear what advice you have to offer! Kudos to you Mara. So very thoughtful (as usual) to think of those people who suffered through a power outage this week. You are a wonderful and kind person. You are so sweet, Susie! Thanks for the great tips! The power is out in areas (including our neighborhood) of Detroit too! Fortunately were able to move our meat to someone else’s freezer to saved it. The idea of starting to restock everything that couldn’t be saved is daunting! We will definitely be eating from our stockpile next week :). The meat is the worst…fortunately I have the a great friend (who is hopefully reading this) who went over in the dark to willing to rescue it for us. and don’t forget to contact your insurance company. They may cover the cost! I second Rebecca’s comment — after Hurricane Ike, our insurance company — like many others — reimbursed us for $500 of lost food with no deductible — separate from our home damage claim. We had the money within 3 days, and it helped me not be quite so depressed that ALL THE FOOD my mother in law had cooked and frozen for us for the yamim noraim was lost. Thank you. We were without power for nearly 9 days. A friend just got back power this morning. Our area of Ohio was very hard-hit. Jenna – I’m so sorry! Nine days is a really, really long time 🙁 And yes, the meat is what would kill me. We buy in advance from co-ops, since kosher meat is so expensive and to lose it would really be heart-breaking! Thanks as well for the extremely kind share! I appreciate it!